Teignford, a 3mm Scale Layout. : Tools of the trade. For marking out, these are some of the aids used. 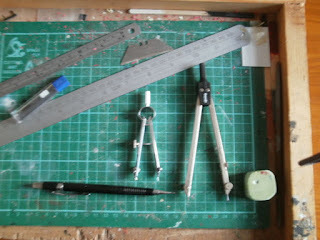 Most important is a straight edge, in this case a 1ft/30cm steel ruler. Also have a six inch rule for use when something a little smaller is needed. Two types of compass, self explaitory really-large and small. To mark out there is a Rotring propelling pencil with .5mm lead-this I have had for at least 25 years and proves that it pays to get the best you can afford. A rubber, this one bought in Majorca erases all unwanted lines or mistakes and is fairly soft. Not shown are the knives I use, mainly a snap off type as the card can be fairly high on usage of blades.